As a rescue to the closed gorilla safaris to Virunga national park, Congo has created a new national park named Ogooue-Leteki with a sole purpose of sheltering gorillas and forest elephants. Virunga national park was closed for tourism in May 2018 following the kidnap of travelers and the killing of rangers in the park. Ogooue-Leketi parks join other parks in Congo, which include Virunga national park, Kahuzi Biega national park, Salonga national park, Upemba national park, and Garamba national park among others. These parks support different kinds of tourism activities, which attract a large number of travelers from all parts of the world. At present, Virunga national park is closed for tourism but is expected to resume in 2019 if all goes on well. The newly opened Ogooue-Leketi national park covers a total land area of 3,500 square kilometers (1,350 square miles) and is bordered by Bateke Plateau national park in Gabon. The two parks (Ogooue-Leketi and Bateke Plateau) form a trans boundary protected area covering over 5,500 square kilometers (2,120 square miles). Also, Ogooue-Leketi Park is part of the Bateke plateau landscape with a patchwork of large rolling savannas on sandy hills surrounded by long strips of dense forests and turquoise blue river valleys. This savannah –forest complex is home to several threatened species some of which are found nowhere else in Congo. 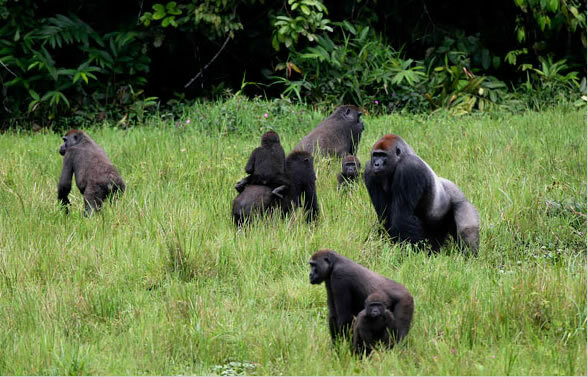 The area has been confirmed safe for wildlife by Wildlife Conservation Society’s Congo program, which has been surveying he area together with Congo’s ministry of forestry economy since 2004. The region where Ogooue-Leketi Park sits was first identified in 2009 by the International Union for Conservation of Nature (IUCN). The site was inspected and confirmed suitable for the protection of the critically endangered western gorillas (Gorilla gorilla gorilla) and the critically endangered central chimpanzee (pan troglodytes troglodytes) as reported by Mark Gately, the country director for WCS-Congo. , red river hog (potamochoerus porcus) and several species of monkey including the iconic mandrill (Mandrillus sphinx). 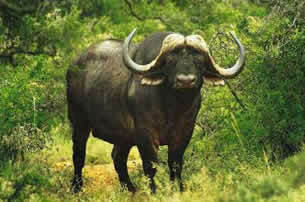 The savannah part of the national park hosts a wide range of wildlife and is a best spot for game viewing. Ogooue-leketi national park is a home to at least six species of rare savanna plants that are specialist of the Kalahari sands the substrate that forms the Bateke plateau and other savanna specialist like the bush duiker (Sylvicapra grimmia), side-striped jackal (Canis adustus) and several species of birds. The new park was also identified as a site of high importance for bird conservation in 2007 by the bird life international. Fortunately, logging which has been a major threat to the survival of wildlife in this park has been closed which give hope for survival. Logging has been a thereat in this forest since 2013 where local people come into the forest in search for okoume trees (Aucoume Klaineana) used in making plywood. The elimination of logging activities in Ogooue-Loteki Park is attributed to the tireless support of the Congolese minister of forestry economy. This has secured the closed forest canopies, which covers nearly half of the entirely national park. Hunting for bush meat is yet another threat which for long affected the existence of wildlife in Ogooue-Loteki national park. Roads and bridges that were built by logging companies in the forest facilitate hunting. Buh mest is furyter transferred to cities of Pointe Noire and Brazzaville in the borders towards Gabon. Great ape numbers have declined significantly in the area since 2010 and elephants, even if their population seems stable, recently changing their behavior-visiting forest clearings more at night than during the day, behavior that is generally observed in elephant populations that perceive threats from humans in their habitat. Since the logging companies out of the forest, the government and WCS-Congo are now working with local communities to draw up a management plan for the national park. While no villages existed inside the area, now deigned as Ogooue-Leketi national park, there are five villages very close to the boundary., the residents of these villages have traditionally used the national park area for their needs and continue to depend on the forest for their sustenance. Good enough, local people have bee involved in the establishment of the new park, which has attracted local support towards conservation. Boundaries have been drawn between the park and community land to ensure that villages are incorporated into parkland. Local people further helped to identify areas with rich cultural norms and traditions to promote cultural tourism in the region. In general, the opening of a new park is a great achievement for tourism and conservation fraternity in Democratic republic of Congo. Book a Congo safari; visit the gorillas and elephants in a new park for a lifetime experience.